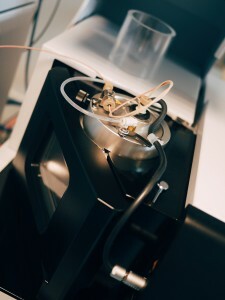 Our Mass-Spectrometry Service uses a Shimadzu LCMS-8040 – a triple quadrupole mass spectrometer with high sensitivity, high speed and high reliability. Analysis of both positive and negative ions is possible in the same experiment due to the ultrafast polarity switching capabilities – allowing for simultaneous analysis. The ability to do quantitation with good linearity makes this an ideal tool for drug studies. We have extensive experience and knowledge in method development for new compounds along with excellent expertise in interpretation of results – providing a complete service to your analytical requirements. High Sensitivity – Incorporation of improved ion optics and collision cell technology allows this machine to provide higher multiple reaction monitoring (MRM) sensitivity by up to 5-fold. This was achieved by improving ion focusing and minimising ion losses between multi-pole lenses. This higher sensitivity expands the potential range of LC/MS/MS applications. High Speed – The LCMS-8040’s high speed does not compromise on sensitivity. MRM transition speeds reach up to 555 MRMs per second due to improved collision cell technology, proprietary high-precision quadrupole machining capabilities, and unique high voltage power supply technology. Furthermore, the LCMS-8040 features ultra fast polarity switching at 15 msec. With this high-speed performance, the instrument dramatically improves analytical throughput. High Reliability – MRM optimisation in this machine is based on a rapid series of automated flow injection analyses, requiring minutes to perform. MRM parameters optimised for other machines can be transferred to the LCMS-8040, making it possible to transfer methods between systems. At the Bio-Analysis Centre we use LabSolutions LCMS software as it offers a variety of data processing features, including a Quantitation Browser, which processes multiple analytes, and a Data Browser, which allows us to analyze and compare multiple sets of data in the same window.